Oldham Council is once again operating policy based on double standards with their new two-tier system on changes to refuse collection services. 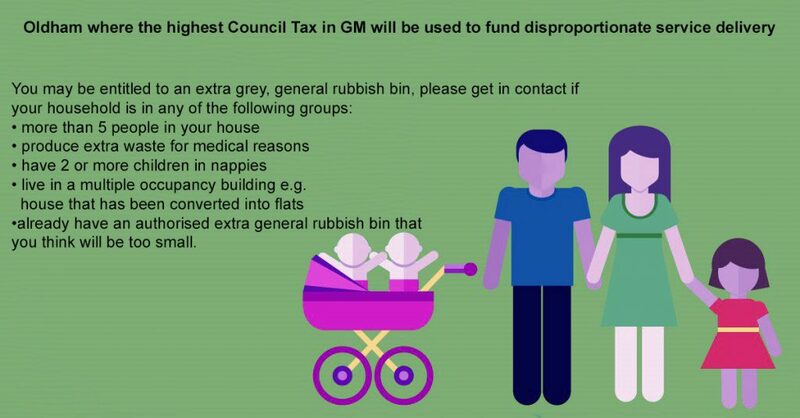 They are cutting collection service frequency to encourage recycling but are charging the same Council Tax while providing extra non-recycling capacity just for families at no extra cost. Many of Oldham’s benefit-free working age residents already feel we contribute enough subsidising Oldham’s £315 million+ family tax credit, child benefit, Council Tax BENEFIT and housing benefit bill and we pay our council tax to provide services for our own homes and not to subsidise vast numbers of non-contributory families that maintain and expand Oldham’s joint fifth highest UK birth rate. We absolutely question the legality of this discriminative practice of providing extra services for homes that do not pay any additional charges while denying the same services to all council tax paying households. The Oldham Council image that goes along with the advert. Our copy of the advert along with the body text copied verbatim from the Oldham Council website.